I’m going to say it: this is my new favorite glitter. I somehow purchased it in a blind polish-buying stupor, was pleasantly surprised when I saw the bottle in person, and totally blown away when I put it on. This is Dance Legend’s “Chumash,” from the Malibu Collection. It is a bright green cruelly with white and lime small glitters, medium pink and lime square glitters, and white diamond-shaped glitters. The glitter payoff is fantastic, and there’s no fishing necessary. Square glitter lovers- behold! This is three thin coats, with two rounds of top coat. With all the glitter in there, this just eats top coat, so if you’ve got something like “Glitter Food,” you might try that to get the glassy look on top. Oh man, this is just so fun and spunky. I want to wear it all summer (and I probably will). I picked this up at Llarowe, but it is also still available at the Dance Legend website. If you’re on the fence, consider that I’m not normally a glitter person, and this has stolen my (admittedly fickle) heart. Are there more polishes like this? I need them all! OMG what a fun polish! Love this glitter! I don’t have any Dance Legend polishes and keep meaning to try them. Lovely glitter!! it looks so pretty in the bottle I don’t think I would be able to use it. 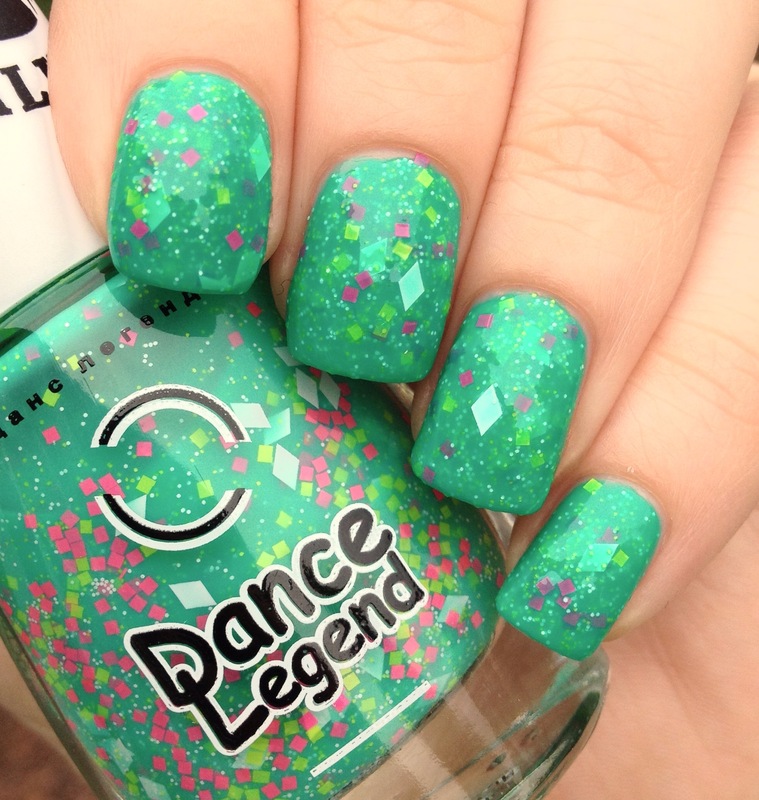 I don’t have any from Dance Legend, but this is stunning AND it’s green!! I’m a sucker for green! love this! i’ve been dying to try this brand forever! I have been wanting to try out this brand for a long time. The shade of green is gorgeous and so unique! This one is so much fun with the bright base and colours of glitter! This is the first I’ve noticed the diamond shape glitter outside of indies too! I really like how easily the glitters can been seen in this. There’s nothing more frustrating to me than a polish with fun glitters that get covered up by the base color.